Cell phone, Wii and iPhone development aren't normally the sorts of things that gamers associate with id Software, but the company has a history of creating outside the scope of top-tier PC gaming. That's why it's not too surprising to read that John Carmack, id co-founder, says the company is looking at Wii development alongside its iPhone plans. Carmack tells MTV Multiplayer that he spends "far more time playing Wii with my four year-old boy than I do with any other game console." That doesn't mean the company's "id Tech 5" racer-shooter Rage will be coming to Wii, however. "Rage is not a viable option on the Wii because of the technology," Carmack says. "We've been pitched and talked about a project to do a title that would fit well on the Wii, and it's actually related to an iPhone title that we're doing." That sounds like a change in tune for the developer, who said last Summer that he didn't think id's games would be appearing on the platform. 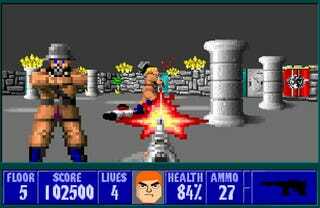 Carmack says that the developer's port of Wolfenstein 3D will be hitting the iPhone soon. Can we expect a Wii release? Has WiiWare changed John's mind?